Mid-Century Modern Design Style is all about embracing minimalism. Mid-Century Modern, heavily influenced by the German Bauhaus construction style, flourished from 1940s-1960s and is making its way back onto the interior design scene. Clean lines, vivid colors, and bold geometric designs shape the aesthetic of this design style. The nostalgia of the 1950’s continually influences modern design styles in art, media, and interior design. 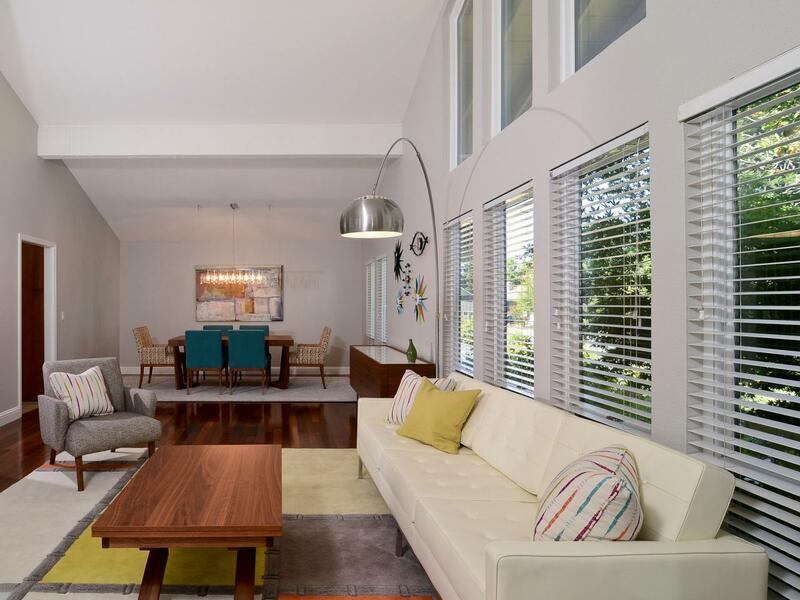 Here are a few tips on how to design your window treatments to fit the Mid-Century Modern Design Style in the 21st Century. There are a number of different aesthetics you can use to design your window treatments to be Mid-Century Modern Design. The colors you choose, complimentary furniture you select, and the materials you decide all play a huge part in the design of your custom window treatments. What makes a design Mid-Century Modern? You’re about to find out. Focus on furniture with clean, sweeping lines, curved edges, and bold shapes. The classic mid-century modern lounge chair and egg chair, are fundamental pieces of mid-century modern furniture design. Utilize vintage pieces as modes of inspiration when furnishing your living space. Pair the clean lines of your furniture with textured, custom window treatments. Adding various textures/materials to your space will add dimension and intrigue without the nuisance of clutter. 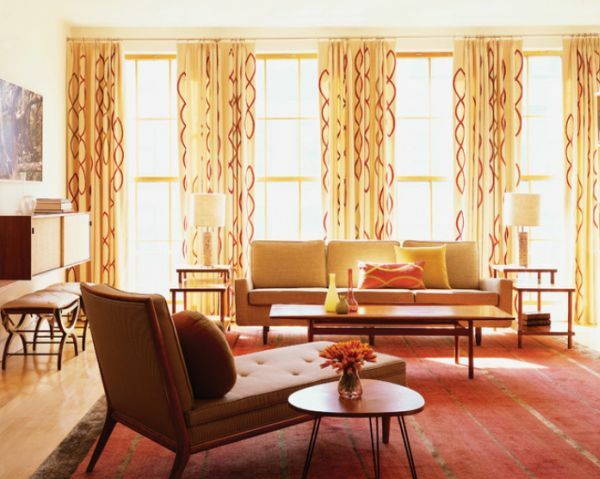 Indulge in custom draperies, incorporating the neutrals of your space to balance out your minimal uses of bold color. Pairing sheers with a heavier custom draperies adds a delicate touch of detail to your space and frames your window. Interested in other custom window treatment styles or interior design advice? Designers incorporated both organic and inorganic materials, to achieve an innovative interior design. Plastics and woods pervaded within Mid-Century Modern furniture style and continue to do so today. 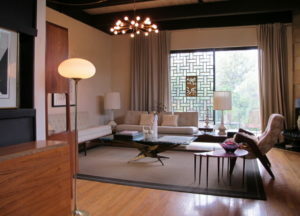 Teak, walnut, oak, and rosewood stole the show and were implemented by the most renowned mid-century modern designers. Don’t be afraid to mix materials to find the right balance that fits your personal style! Horizontal blinds pair well with Mid-century modern design style because of their clean, sweeping design aesthetic. Blinds provide a variety of light filtering, as well as privacy. Their unobtrusive design pairs well with a minimalistic aesthetic and a variety of furniture materials. Play with various bold color pallets to help access your interior design style. Play with pastels, teals, mustard yellows, tangerine oranges, avocado greens, bright reds, and neutrals! Incorporate bold touches of color within the graphic design on your custom draperies to add a bold focal point, frame your window coverings, and provide light and privacy utility. Whether installing shutters, valances, or window blinds, focus on whimsical patterns and geometries that offer both an artistic aesthetic and functionality. Want Mid-Century Modern Designed Window Treatments? We are a professional window coverings company in LA and often find that window fashions are overlooked. They are that finishing touch that really pulls the room together. 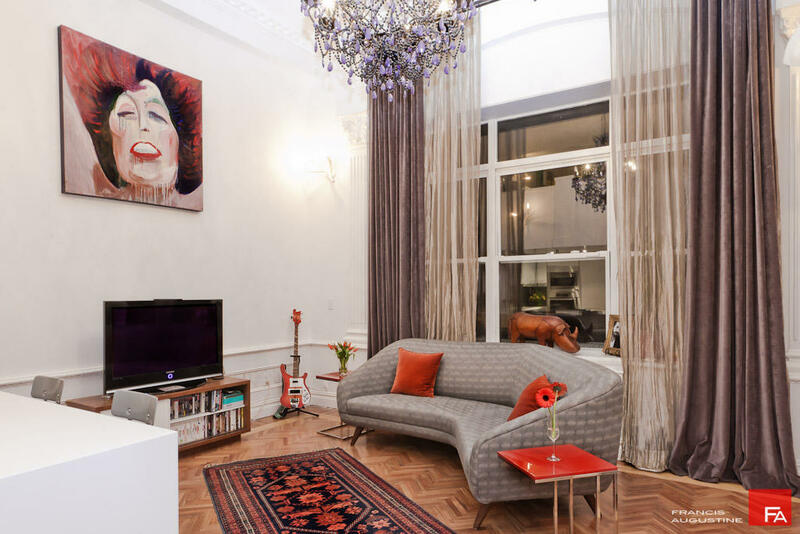 If you are looking to make a fast change to your home, updating your window coverings is a choice that will last for decades and inspire you ever day.